The euro has hit a record high against the dollar, defying recent political squabbles over the single currency and upbeat US economic data. The euro continued a long upward run to hit $1.20 in lunchtime trading, up three quarters of a percent, mainly at the expense of a weakening dollar. Faith in the US has been undermined by concerns over mounting deficits despite evidence of a return to growth. Global security concerns have also made markets wary of the US currency. The euro's strength may also have benefited from thin trading during the US Thanksgiving holiday, exaggerating the effect of trades. The 12-country currency hit $1.2015 in European trading - the highest since it was introduced on January 1, 1999, then slipped back to $1.1995. It started the European trading day at around $1.19, then headed steadily up, breaking through the previous high of $1.1979 from 19 November. 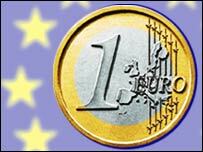 In New York, the euro traded at $1.1987 late on Friday. The record performance also means a coming of age for the 5-year-old euro, proving robust enough to ride out recent concerns about political factors interfering with the currency's launch criteria. Earlier this week European Union ministers stopped short of imposing fines on Germany and France, the single currency's two biggest economies, despite their having breached budget deficit rules aimed at anchoring the euro with austere fiscal management. But Franco-German profligacy has paled beside US deficits, resulting from massive tax cuts and spending increases aimed at stimulating growth. Recent data and economic forecasts suggest that goal is being achieved, with annualised growth in the three months to September soaring 8.2%. But currency markets pay more attention to the current account deficit - the balance between what the US buys in goods and services and what it sells - which stands at 5% of gross domestic product and is set to expand. The eurozone, by contrast, has a current account surplus. Further eroding confidence in the greenback are clashes with a number of the US's major trading partners over tariffs. The prospect of trade disputes make it less likely that the US will be able to balance its books with revived exports, putting more pressure on the exchange rate.